So you're ready to become a homeowner. You've worked hard and saved enough money for a down payment. Perhaps you've even found "the" house. As most first-time homebuyers are most concerned with saving up enough for the down payment and affording the monthly mortgage payment for the next fifteen to thirty years, they tend to overlook the other costs associated with buying a home. That is until they receive the Good Faith Estimate (GFE) or Loan Estimate (LE) from their mortgage lender. When it comes to getting a mortgage, there are more costs associated with the loan than the down payment and monthly payment. So, "how much is this loan going to cost me?" you rightfully ask. That's where the Good Faith Estimate (GFE) comes in. The GFE is essentially an estimate of settlement or closing costs that lists the additional expenses you will be expected to pay at your closing. As a result of the Real Estate Settlement Procedures Act (RESPA), providing a GFE within three business days of mortgage application became federally mandated, mostly in an effort to ensure transparency in the loan process. It is a three-page itemized list of all of the fees and costs associated with the home loan from title insurance, taxes, home inspection, among others. But as the name implies, it is but an estimate of those fees. 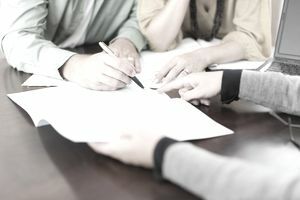 While the good faith estimate is meant to provide transparency and give the home buyer an estimate of the additional funds they will need at closing, the GFE is just that, an estimate. Unfortunately, there's often a large discrepancy between the GFE and what you actually end up paying at closing. Since most homebuyers shop around for the best mortgage offer, the GFE provides yet another basis for comparison along with other important loan factors like the interest rate and monthly payment. But some unscrupulous lenders intentionally low-ball the estimate in order to get your loan, knowing that by the time you see the actual amounts (which is typically the day before closing), you'll be so deep into the process that you won't pull out and look for another lender. The Loan Estimate is the new federally-mandated document that has replaced the GFE and TILA statement. The Loan Estimate is a simplified, integrated document that aims to reduce borrower confusion by providing all estimated costs and an overview of borrower obligations into one place. The new Loan Estimate is also meant to make comparison loan shopping easier, and, of course, to prevent expensive surprises for the homebuyer at closing. While some of the figures provided are still estimates, it is illegal for lenders to deliberately underestimate the fees and costs outlined in your Loan Estimate. Additionally, while some costs can change from the Loan Estimate to closing under certain specified circumstances, there are costs that cannot be increased. Those costs are delineated on the Loan Estimate. Typically, closing costs run between 3% and 5% of your total loan amount, so if you're borrowing $100,000 you can expect closing costs somewhere between $3,000 and $5,000. If you're borrowing $200,000 you can expect closing costs of $6,000 to $10,000. Property taxes placed in an escrow account are one of the largest expenses at closing. The amount depends on the value of the house you buy and the tax rate in the town or county where the house is located. The smart thing to do is to obtain Loan Estimates from two or three lenders and compare the loan details as well as all of the costs. You will then be prepared to ask the lender you choose to meet the best offer terms. By doing so, you protect yourself from being taken advantage of at closing and going to closing unprepared.